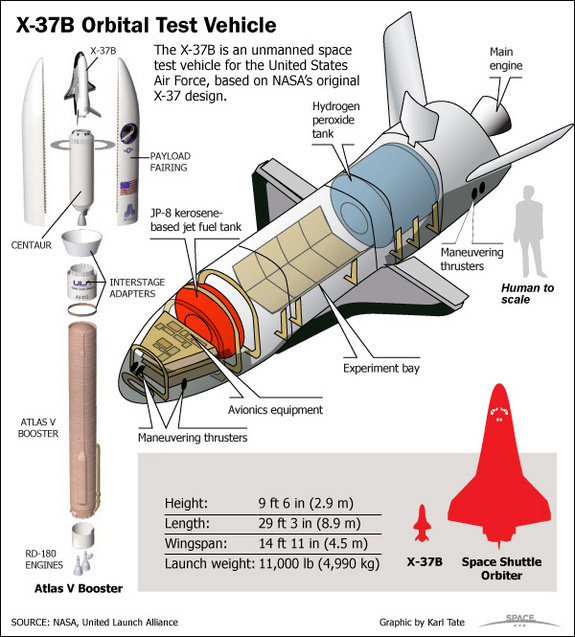 After more than a year in space, the U.S. Air Force's secretive robotic space plane, the X-37B, is coming down soon. That's the word today (May 30) from officials at Vandenberg Air Force Base in California, the site where the reusable miniature space shuttle will land in the next few weeks, technical and weather conditions permitting. While the exact landing date and time of the unmanned X-37B space plane is not yet determined, according to a Vandenberg Air Force Base statement, the craft’s touchdown "is expected to occur during the early- to mid-June timeframe." Preparations for the second landing of the X-37B are now underway at the Air Force base. "The men and women of Team Vandenberg are ready to execute safe landing operations anytime and at a moment’s notice," said Col. Nina Armagno, 30th Space Wing commander.